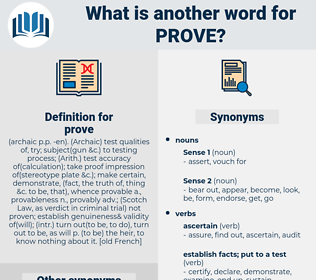 What is another word for prove? settle once and for all. are, show, confirm, testify, reveal, illustrate, indicate, suggest, affirm. demonstrated, demonstrating, show, substantiate, confirm, attest, testify, establish, Establishing, reveal, illustrate, indicate, verify, be, Was, is, justify, convince, validate, showcase, suggest, affirm, disclose, prepare, determine, render, highlight, reaffirm. disprove, testing, transpire, assert, ascertain. assist, reject, help, invalidate, confuse, discredit, aid, hypothesize, disprove, theorize, conceal, disclaim, refuse, disavow, deny, unsettle, veto, hide, contradict, miss, refute. challenge, guess, allege, suspect, cancel, conjecture, upset, annul, console, abrogate, condole with, object, dispute, overthrow, destroy, presume, weaken, shatter, surmise, shake. Perhaps he did prove that.
" What does that prove? establish, show, demonstrate, authenticate, prove, shew.